Shows: There are numerous shows offered during the Christmas season including classics like “It’s a Wonderful Life” and “A Dickens’ Christmas Carol.” Also check out “Christmas on the Bayou,” “Frontier Fa-La-La Follies,” “Holiday Hearthside Harmonies,” “The Living Nativity,” “Tinker Junior’s Toy Shop,” and piano extraordinaire Tracy Heaston. Interactive Experiences: Meet Rudolph and Clarice and Bumble the Abominable Snow Monster at Rudolph’s Christmas Town. Then stroll down Santa Claus Lane to meet Santa himself along with his Christmas elves. During select Saturdays and Sundays guests can even have lunch with Santa featuring a delicious buffet meal. Dining: There are several holiday buffets such as Molly’s Mill Holiday Harvest Buffet, Lucky Silver Mine Buffet, and the Reunion Hall Prime Rib Buffet. Also be sure to try their famous funnel cakes, smores kettle corn, walking tacos, wassail, apple dumplings, hot breadsticks, and more. Shopping: Be sure to stop by all of the classic shops during your visit to the park. Find merchandise such as Christmas ornaments, homemade apple butter, t-shirts, collectibles, and more! Attractions: All non-water attractions will be open during An Old Time Christmas. Take a ride on the new Time Traveler roller coaster or head to The Grand Exposition for kid-friendly rides. Make sure to stop by the Homestead Animal Barnyard to meet various cute critters such as goats, rabbits, miniature horses, pigs, and more. Lights: When it gets dark out, the 6.5 million lights dazzle even more! Walk through Midtown and explore over 1.5 million lights. There’s perfect photo opps including taking selfies in one of the light tunnels. Stop in front of the 5-story Christmas tree and watch an amazing light show. Or, take a ride on the Frisco Sing-Along Steam train where you’ll sing along to classic Christmas songs and hear the true meaning of Christmas told. At the end of each night be sure to catch Rudolph’s Holly Jolly Christmas Light parade with a variety of floats, characters, and music. 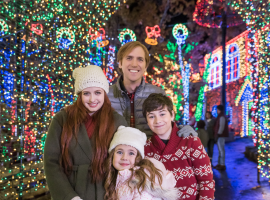 Create special memories with family and friends during this holiday season at Silver Dollar City!